Lateral what, you ask? If you don’t know what this is, you aren’t alone. In fact, it took me quite a while to understand how important lateral bracing is to the success of a model bridge, especially when striving for high strength or efficiency. Lateral bracing is the term we use to refer to any pieces on a bridge that help keep the sides (trusses) from twisting. It also helps keep the top chords of the bridge from bending or deforming in or out. In the figure above, the lateral bracing is marked red. Why is lateral bracing so important? The shorter a piece of wood, the more compression it can hold before failure. Lateral bracing serves to break the top chord into smaller sections, giving it more strength. It does this by keeping the top chord from twisting or bending. The purpose is similar to that of the main trusses, but it isn’t quite the same. While the truss experiences a lot of force any time the bridge is loaded, the lateral bracing only experiences forces when the top chord starts to deform (twist or bend). Then, and only then, does it come into play. 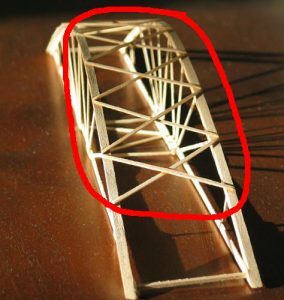 This is why in a typical model bridge, the lateral bracing pieces are much smaller than the truss pieces. However, don’t let this make you think that lateral bracing is less important, because it is still very critical. Lateral bracing allows you to make the size and shape of the top chord smaller and oriented to the main downward force. For instance, often in model bridges the top cord is a rectangle piece, with the larger side of the rectangle parallel to the truss. This makes sense, because this orientation allows the top chord to resist force downward. Instead of increasing the small side of the rectangle to resist bending, we add the lateral bracing. When done correctly, this decreases the overall mass of the bridge while still keeping the strength. This in turn, increases the efficiency of the bridge. Another important job for the lateral bracing is to connect the two sides of the bridge together, and keep them parallel to each other. The latter of these two things is also very important for sharing the overall load on the bridge equally between the two sides of the bridge. If the sides of the bridge get out of whack from each other, the load sharing goes down and one side will fail prematurely. Usually we only see lateral bracing on the top of the bridge, and maybe on the two openings for traffic to pass through. This is because the top chords of the bridge are being compressed, but the bottom chords are being pulled in tension, and they are not going to bend or twist in the same way as the top chords will. When you push something it tends to bend or deform. The bottom of a model bridge doesn’t need lateral bracing because they aren’t twisting or bending in the same way. Only the top chords need the extra support to stay straight. Sometimes based on how the bridge will be loaded, lateral bracing is added to the bottom chords to give extra stability to the loading area. Lateral bracing can be done a number of different ways. The key, like designing a truss, is making triangle shapes. An X shape for lateral bracing is beneficial because the x’s make the top chords into a series of triangle shaped sections. Triangles are the go-to shape when building structures, especially model bridges. The triangle is really good at resisting being deformed, which is the whole point of lateral bracing. You could make a zig-zag pattern across the top instead of a series of x’s if you are trying to save some weight or materials. There is a place and time when you can use straight pieces for lateral bracing instead of X’s. That idea is illustrated by the Fernbank Bridge. Notice that this bridge uses an L-beam for the top chord. And a large L-beam at that. The key lies in that fact; the straight pieces across the top had a very large surface area joining them to the top chord. This automatically made them stiff, and able to resist deforming. This is imitating what a triangle does, and worked very well for the Fernbank Bridge. This idea will not work unless you have the large surface to glue the lateral bracing to the top chords, so be careful if you decide to try it out. How much lateral bracing do you need? The amount of lateral bracing you need to use is based on the shape of your top chords. The top chords are most often rectangle shaped, with the skinny side facing up and down and the wide side facing horizontally. A rectangle shaped piece of wood is easy to bend in one direction, but not in the other. If your top chords are rectangle shaped, remember this and use enough lateral bracing to keep the top chords from bending in or out. Other shapes for top chords are square, T, L, or I beams. The square is probably the least efficient, but is the easiest to manufacture. If you want to use an T, L, or I beam on your model bridge, chances are that you will have to make it yourself by gluing two or more pieces of wood together. These types of beams will need less lateral bracing. However, they are tricky to make and you need to be precise and accurate when you make them. Otherwise they won’t work well. Generally, most bridges don’t use enough lateral bracing. Lateral bracing is supporting less of a load than the truss members, so the pieces used for lateral bracing can be smaller. 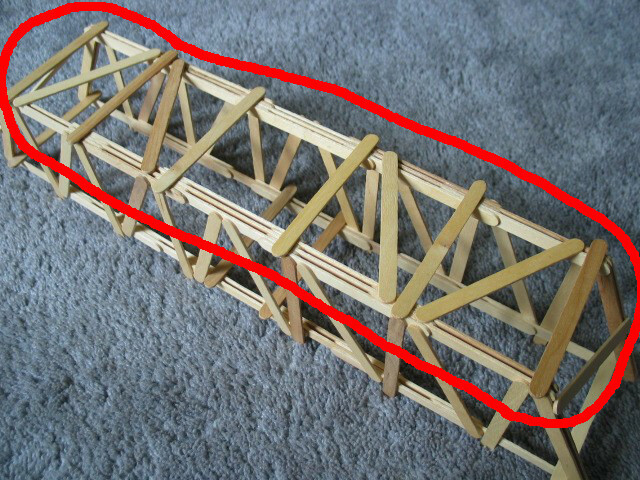 See this Science Olympiad bridge for another example of small but very effective lateral bracing. Are top lateral bracing in compression, tension or both? Both depending on how the bridge twists. Unlike the Truss, it is harder to predict what pieces of the lateral bracing will be in tension or compression. Thanks so much this help my group with ouR project!!! Hey, I’m making a bridge shaped like a triangular prism. Would you have any ideas of how the lack of upper lateral bracing might affect my bridge? Thank you very much for this. Highest grade, here I come! How do you make a cross/ X piece of wood without laying the pieces of wood on top of each other? Or is that what you’re supposed to do? thanks man! im doing a report on bridges. This will help alot! 36 queries in 0.566 seconds.